A week after surviving my first visit to Mad River Glen in January of 1969 I was off for my first skiing trip to the western United States. There were four of us on the trip: Clint Demeritt , Mike Weisel, Mike’s girlfriend Pat, and myself. Clint was a fellow IBMer while both Mike and Pat were still UNH undergrads so the timing of our trip was to coincide with their semester break. Yes, semester breaks were a lot later in those days! By the way, Mike and Pat were married after graduation and now live in Underhill. Our destination was Aspen, Colorado. Aspen in the 1960s was the dream destination for those of us in the Northeast. Ski movies and magazines had filled our heads with images of powder and sunshine, most of which centered on Aspen. That was because most of the other western areas were still young, at least as far as being a destination resort. Vail, for example, opened in 1962 and by 1969 only had a small number of places to stay or eat. 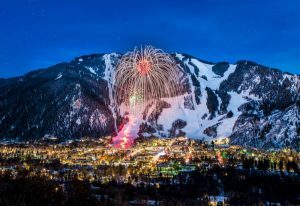 Aspen was an established town since the 1870s and skiing started there in the 1940s. Famous skiers came to Aspen and famous celebrities also became regular visitors. We flew out of Boston since the Burlington airport didn’t have major airline connections in those days. As I recall most flights out of Burlington were on Slow-Hawk, uh…, I meant Mohawk airlines. It took two hops to fly from Burlington to Poughkeepsie, New York, a popular IBM route. Our first surprise when we landed in Denver was no snow and temperatures were in the 60s. Of course everyone knows now that Denver weather has little to do with the mountains, but they didn’t tell us that in the movies and magazines. Indeed, once we climbed into the mountains on Route 6 snow was evident. That brings us to Loveland Pass. Route 6 winds its way up over the Continental Divide at an elevation of 11,990 feet. The road was packed snow and the guardrails were non-existent! 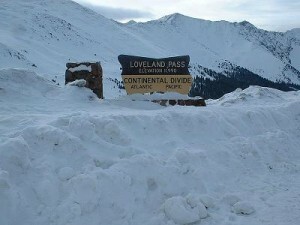 I’ve written about the Loveland Pass experience in past RetroSki columns, but it was a “white knuckle” rite of passage for eastern skiers heading to Aspen or Vail. Thankfully the weather was good for our first time. Of course since 1973 skiers are spared that experience thanks to the Eisenhower and Johnson tunnels that bypass the last 1000 feet of elevation. The tunnels have created a new hazard – traffic! In early January this year I drove west on I-70 at the end of what must have been a beautiful weekend ski day. Traffic in the eastbound lanes was stop-and-go as skiers headed back to Denver. On the Summit County side of the tunnel there was a multi-lane, six mile backup waiting to get through the tunnel! Back to 1969: In Aspen we stayed at the Little Red Ski Hostel. As the name implies, we stayed in dorm-like facilities, but the price was right. 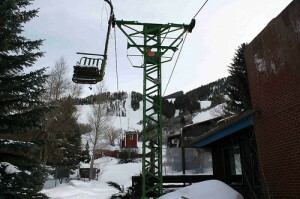 Plus it was located in walking distance of everything – lifts, restaurants, and bars! It is now a luxury ski house called the Little Red Ski Haus and was on the market in 2017 for $11.8 million! As for the skiing, there were four mountains that comprised Aspen just like today. The original mountain, Ajax, that rises right out of the town, plus Buttermilk, Aspen Highlands, and Snowmass which was only two years old in 1969. However Ajax will always be the one I remember from that first visit. From that first ride up Lift 1, the single chair built in 1946 that went on and on and on up the mountain. It was 8000 feet in length and the mountain just kept unfolding beneath you as you rode up. And when it finally ended, there was another lift above that! Welcome to western skiing. Then there were the trails. One that we had heard of was Ruthie’s Run which was named after the wife of D. R. C. Brown, long-time head of the Aspen Skiing Company. Ruth Brown invested $5000 in the company in 1950 that helped allow the area to host the first major international alpine ski championship in North America. To reward her (plus to give her an easier way down the mountain) Ruthie’s Run was named after her. 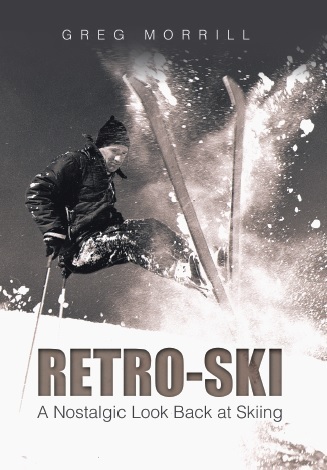 I probably should have worded last week’s trivia question as “What ski area has the ‘original’ Ruthie’s Run?” Chuck Perkins shared that there’s a ski shop in Lake Placid with that name. Norma Stancliffe just finished skiing Ruthie’s at Smuggs (named for Ruth Brewster) when she submitted her answer. However Ron Waxman, Russ Hausman, and Lyndall Heyer named Aspen as the home of the original Ruthie’s Run.